The body of a man was found Saturday afternoon in Pointe Claire, TVA saying it was in the parking lot of a hotel. It’s not clear yet whether this was a homicide. Update Sunday: CTV reports that the man was shot dead and the phrasing suggests it was an attacker, not suicide. The law community wants to claim the old courthouse building as the kernel of a Quartier de la justice – after it’s finished serving as backup city hall as it’s set to do from 2019 till 2021. Some people want a station on the REM in the southwest of the city to be named for the Irish community – Station des Irlandais. 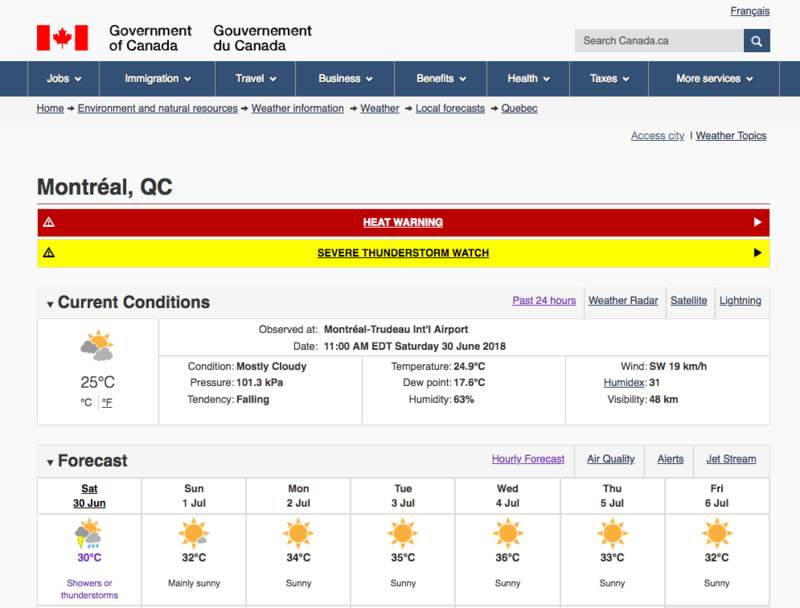 Two scare banners on the government’s weather information page: a heat warning and a severe thunderstorm watch! Media are running lists of products that will be more expensive as of Sunday because of the trade war. Some of the things on this list are puzzling: who buys American maple syrup in Canada? Do people really buy American coffee? (Mine comes from Italy.) Soy sauce? (China.) Whisky? (Scotland or Ireland.) Chocolate? I will be looking at more labels soon. CTV notes that people may move naturally away from U.S. products as their prices go up. A lot of my contacts are linking this Globe and Mail piece about how livable Montreal is. While the Toronto writer praises our affordable rents, an op-ed in Le Devoir considers how landlords often hike rents excessively between tenants. The city is way behind on redoing street markings like pedestrian crosswalks, with some scheduled to be done just before winter. The strike by crane operators meant 17 days of delay on the new bridge and means it won’t be completed by the deadline of December 21. I suspect there was a sigh of relief in the construction management office in finding a scapegoat for the missed deadline. Longtime CTV Montreal news anchor Mutsumi Takahashi has been named to the Order of Canada. The full list includes Lise Bissonnette, who’s been editor of Le Devoir and head of the Grande bibliothèque, and Paul-André Linteau, who’s written extensively on the history of this city. With a heat wave coming, the city is keeping its swimming and paddling pools and various water jet features open later than usual. Full list here. 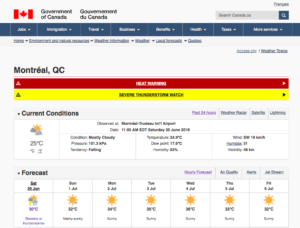 Some general heat advice and a list of places with air conditioning; some festivities have been cancelled as we wait for what’s predicted to be the hottest Canada Day on record. Roberto Rocha has made Radio-Canada a map of the hottest and coolest parts of the city. Not surprisingly, it’s coolest near water and under trees. Also, Radio-Canada’s list of what’s open and closed. As Michael Black points out below, some of the lists of cool places intersect poorly with the holiday weekend. The Grande bibliothèque and the city library network are definitely closed Sunday, for example, and the Grande b. is always closed on Mondays. The Guardian Cities is running a Mireille Silcoff piece on moving day in Montreal. But the idea that the day was moved from May to July to mess with Canada Day is dubious: it was a bill proposed by Quebec Liberal justice minister Jérôme Choquette in 1973 because the May date cut into the school year and meant kids would sometimes have to write exams and finish their year in an unfamiliar school. Wikipedia. A park in Montreal North supposedly to honour Fredy Villanueva won’t be named for him or have any image of him. How any observer is to link the park to Fredy or his unfortunate demise is anyone’s guess. Update: Borough mayor Christine Black says naming the park for Fredy was felt to be too polarizing, but some feel that calling the park “de l’Espoir” is a further insult to the family. Who would begrudge the Villanueva family a memorial for their son? The police. The PLQ’s new religious neutrality law has hit a snag with a judge already ruling against the ban on receiving any public service with a face covering. The DSP, the public health authority, is bracing for the heat wave which the weather page suggests will start Sunday and continue through next week with highs in the general area of 34° and coinciding with moving day. The usual advice is here to stay inside, keep cool, and check on older relatives and neighbours if you can.